Four new Congress members who were elected in November and nine others who won re-election will be sworn into the U.S. House of Representatives on Thursday at noon. That's when the 116th Congress will officially begin. WASHINGTON (WXYZ) — Four new Congress members who were elected in November and nine others who won re-election will be sworn into the U.S. House of Representatives on Thursday. That's when the 116th Congress will officially begin. Rashida Tlaib was elected to Michigan's 13th District, the seat which was long held by former Rep. John Conyers until he announced his retirement last year amid sexual harassment claims. Brenda Jones is currently in that seat after winning the special election. 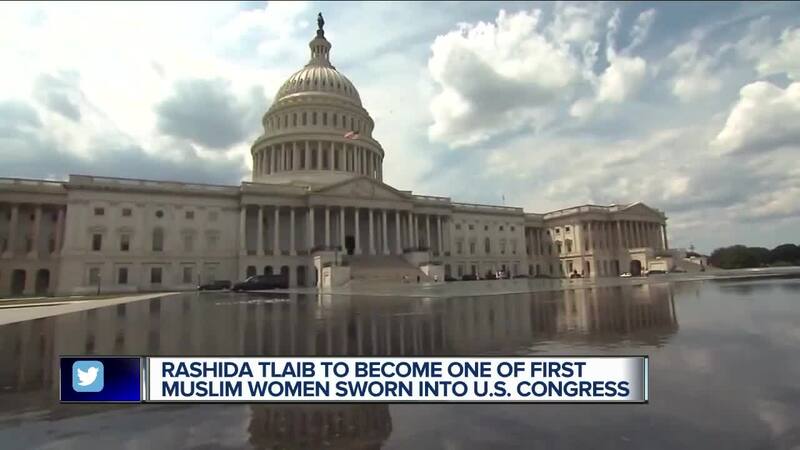 Tlaib will be one of the first Muslim women to serve in Congress when she's sworn in with Ilan Omar, a Democrat from Minnesota. Haley Stevens, a Democrat, will represent Michigan's 11th District. She beat out Lena Epstein and flipped the seat from Republican to Democrat during the general election. Elissa Slotkin also flipped one of Michigan's congressional seats from red to blue in November. She beat incumbent Mike Bishop in Michigan's 8th congressional district. Finally, Andy Levin will be sworn in to Michigan's 9th congressional district, taking over for his father, Sandy Levin. At 12 p.m., the House is expected to elect Rep. Nancy Pelosi as the new Speaker, and according to the House of Representatives website, the member with the longest-continuous service will administer the oath of office to the Speaker. The speaker will then administer the oath to the rest of the members of Congress en masse.